The board of directors of the Neighborhood Housing Services of New York City recently appointed interim chief executive officer Bernell Grier as the CEO of the organization. Ms. Grier has built up an impressive resume as a banker having over her career serving as EVP, Retail Community Banking; SVP Middle Marketing Lending; Community Development Director; and credit program co-manager – all before moving full time to NHS of NYC. As COO, Bernell helped steer the NHS offices in New York City’s five boroughs through the rough waters of the collapsing housing market, and has continued to work to expand NHS’s base of donors and projects. We had the pleasure of talking with her on a bright June morning in midtown Manhattan before her full docket of business got under way. Bernell’s career trajectory is a wonderful example of how preparation and consideration can meet serendipity, as she has moved between the corporate and nonprofit worlds with ease, a smile, and a strong sense of calling to community. Her first job as a teenager living in Harlem, New York, was as a Community Outreach Coordinator with “Neighborhood Board No. One.” She began with a plan to teach mathematics in the very public school system that gave her the good start she enjoyed, so she went to City College of New York for teacher accreditation in education and math. The need for a summer job took her to Chase Bank Manhattan, where her people-skills were already evident enough that she was offered a spot in management training. One is tempted here to say “And the rest is history.” But ‘the rest’ is where it gets interesting. Bernell Grier’s burgeoning vocation in community work – really, a return to her precocious community involvement before college – led her to serve on the board of Colony South Brooklyn Houses, Amboy Neighborhood Houses, District 13 Business Advisory Board, on the board of the Caribbean-American Chamber of Commerce and Industry, and she made the extra effort to get involved in her home borough of Harlem, including becoming the Chair of the Harlem YMCA. “I did a lot of volunteering over those twenty-odd years!” she said with a smile. It is also clear that she met, worked with, and became close associates of, a great swathe of the New York banking and neighborhood-action communities. Along with such extensive volunteer work, Ms. Grier’s career in banking continued to swell with successes, including promotion to Senior Vice President. In 1994, Bernell Grier earned the position of Community Development Lender at NatWest in 1995, “and that started a whole new avenue for me. I was able to use all the tools I had as a commercial lender and being so involved in the community, so it was a pretty easy transition.” Another round of bank mergers right after her hire gave her the opportunity to develop the position into one entitled “Community Development,” which had a much broader portfolio of responsibilities and opportunities, of which she became the head. Her position adjusted with further mergers and acquisitions. A move to Fleet Community Bank came in 2003, where she led the New York and New Jersey market, where the retail stores included “financial coaches” who worked with low – moderate income individuals and small businesses. Another merger occurred with Bank of America taking over Fleet Boston Financial, Ms. Grier decided this was a good a time to move on and to accept a severance package. She began to put the word out that she was leaving banking, and in that moment she met Lloyd Brown, then Chair of Neighborhood Housing Services, and Sarah Gerecke, who were on their way to an NHS of NYC board meeting hosted by Bank of America. Sarah was to become CEO of NHS of NYC at that meeting, and though Bernell was drawn to the challenges of becoming COO for the organization, “I didn’t jump [at the opportunity to become COO of NHS].” She had a wealth of connections to call upon. Perhaps some of those connections would bring her other opportunities? Indeed, as our conversation progressed, we were struck by the unconscious ease with which she discusses the fine work of her peers and how they opened doors on her behalf. The draw to NHS proved strong, though, so we want to know how her connections and skills developed in the banking industry were to profit Neighborhood Housing Services. We asked her for some definition of ‘smart goals,’ which led us to a discussion of corporate drive for revenue and the bottom line. Community leadership seeks revenue, of course, but such leaders and their colleagues have other goals as well that might not be so clearly measurable but must be taken into account – and indeed can be marks of success that need to be supported from within and called out to the general public. Doug Smith, who developed the “Achieving Excellence Program” for NeighborWorks America and other community housing groups, defines ‘smart goals’ as “specific, measurable, achievable, realistic, and time bound.” Ms. Grier clearly finds the use of smart goals a rewarding opportunity to keep focus and high morale in any organization, but especially for those having to work through the present economic downturn. Looking forward, Ms. Grier sees signs of hope with the work carried out by her extensive network of community and economic development colleagues. The first concern for the new CEO of NHSNYC is “raising money” [followed by knowing laughter]. 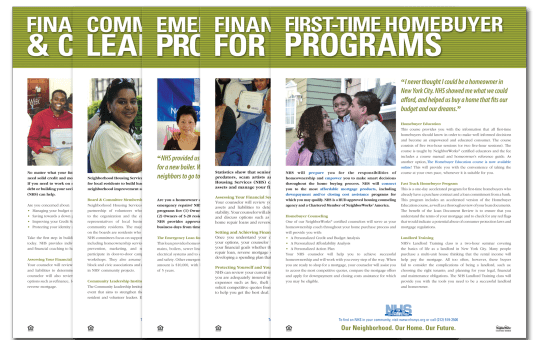 NHS’s Housing Development Department has properties to sell, newly renovated mixed use properties in Brooklyn, the Bronx, Queens and Harlem. These are beautiful developments that are just beginning to move as additional subsidies are available and the banks are now offering end loan mortgages for the purchase of these properties. To overcome many of these market-wide challenges, her organization has launched the “Reposition NHSNYC 2010 Initiative” closely examining the organization’s business and focusing on the delivery and execution of our core strengths Focus is on neighborhood stabilization and preservation and resident leadership combined with the delivery of loan and financial education and counseling. As for delivery of their services, NHS strongly believes in “Face-to-face counseling and education as the best way to serve most of our constituents. We have learned that we can reach new audiences via online training [in the case of NHS, by E-home] … allowing clients to do self-directed learning, and this is complemented by their coming in for one-to-one counseling in order to receive certain incentives and counseling certificates.” The online background provides “a better educated client when she or he comes in and it helps to relieve some of the staff time . Such efforts to educate also serve as a marketing tool, as clients’ comfort with such technologies grows. She also encourages nonprofits to participate in the various social-media competitions and outreach programs. 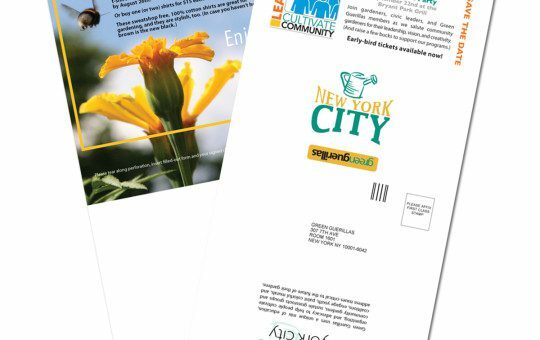 These competitions always raise the profile of the organization, and they can end up offering grants (NHSNYC won about $10 thousand dollars worth of training by the Cambridge Associates Leadership Development workshops in 2009). A revamped website in 2009 has also helped increase traffic to the organization. Oh, there have been some negative lessons as well. NHS was aggressive in its efforts and ambitions to develop a mission driven real-estate broker business a couple of years ago. It proved (in the short-term at least) to be rather far from NHS’s core strengths, and the short-sell market proved to move too slowly for NHS to generate revenue streams to support the business Fortunately, though, the seed money that started it up covered the costs and the other departments of NHSNYC did not suffer losses as a result. The experience reminded her of “a lesson from ‘Business 101.’ [Namely,] Focus on what you do well, and constantly make sure the management information systems are in place to keep the leadership well informed of the financial and operational position of the organization.” Learning from that less-than-successful endeavor helped her sharpen the gameplan for NHS going forward. Does Affordable Housing Perpetuate Racial Segregation?